The benefits from working out on a treadmill on a regular basis include weight management, improved cardiovascular endurance, improved bone density and stress relief, as well as positive changes in blood pressure and cholesterol levels, depending on your original health status. You should notice weight loss benefits during the first two weeks of your workout regimen and then at an ongoing, although less substantial rate, as your body adjusts. Gains in your cardiovascular endurance will be apparent each week as you're able to gradually increase the duration or intensity of your workouts. When you're working out on a treadmill to lose weight, noticeable results may be evident in the first week. It really depends on how often you exercise, the duration of your workouts and the amount of your weekly calorie deficit. If you work out daily and cut your caloric intake by 250 to 500 calories a day, you're more likely to see changes in your body weight, especially over the first two to three weeks on the program. After that, your weight loss should taper off to no more than 2 pounds per week. If you use the treadmill but don't adjust your diet, your weight loss will be more gradual, but will be consistent, as long as you don't increase your caloric intake. With exercise alone, a weight loss of .5 to 1 pound per week is more typical if you work out daily. If you don't notice weight loss in the first week on the program, this is likely the result of stored glycogen and water in your taxed muscles. Continue your workouts and you'll notice progress in weeks two and three as your body gets used to the changes. When you first start a fitness program, your limitations in terms of the speed you can maintain and how long you're able to exercise are indicators of your current cardiovascular fitness. Regular exercise gives you a means to improve your cardiovascular endurance, which essentially conditions your heart to deliver oxygen to your muscles more efficiently and trains your muscles to use that oxygen more efficiently. 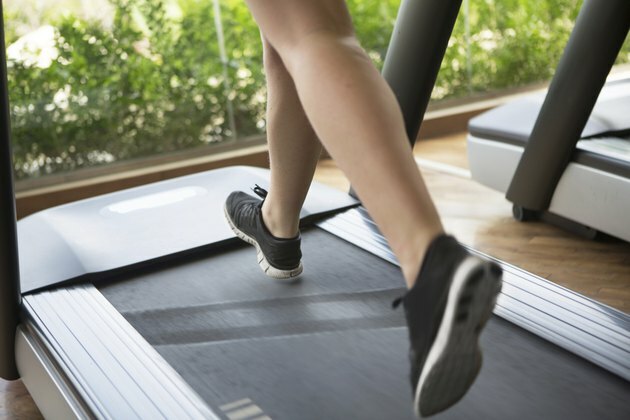 Within two to three weeks on a regular exercise program, you'll notice a positive difference in your ability to perform your treadmill workout. When your workout becomes less challenging, it's time to increase the duration. Once you're able to walk for 30 minutes, increase the incline, your distance or your speed to challenge your cardiovascular system to achieve a new level of fitness. You'll continue to see results in your fitness level as long as you challenge your body when your current exercise routine becomes too easy. If you're hoping to see lasting improvements in your health profile, you need to make exercise a lifetime habit. It takes from four weeks to six months of regular exercise to have a positive effect on blood pressure. You lose the benefits to your blood pressure as soon as you stop exercising regularly. Regular exercise may also help prevent certain types of chronic diseases, such as type 2 diabetes, osteoporosis and some forms of cancer. Your doctor can help you monitor changes in your cholesterol, triglycerides and blood sugar levels to give a better understanding of the effects of exercise on your health profile. You may notice a change in the way your clothes fit or an increase in your energy level within the first month of starting your treadmill regimen. Add variety to your workout routine if treadmill workouts start to get monotonous. The most important element of any exercise program is that you work out regularly, at least five days a week. Any aerobic activity that you perform can help you reach your health, fitness and weight goals. Mixing up your routine will help you challenge different muscle groups. Work with your doctor to design an appropriate exercise routine if you have a history of heart or orthopedic problems. When Will You See Results if You Exercise Every Day?